This week we interview Matt Kiernan: middle distance coach, committee member, volunteer, social media guru and team manager at Croydon Harriers. 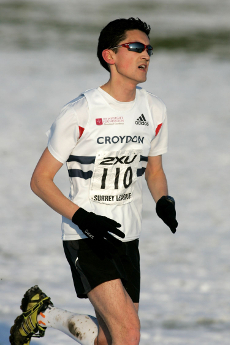 Matt has been involved with Croydon Harriers for 13 years, during which time he's trained with, advised, helped and mentored hundreds of athletes both new and experienced. 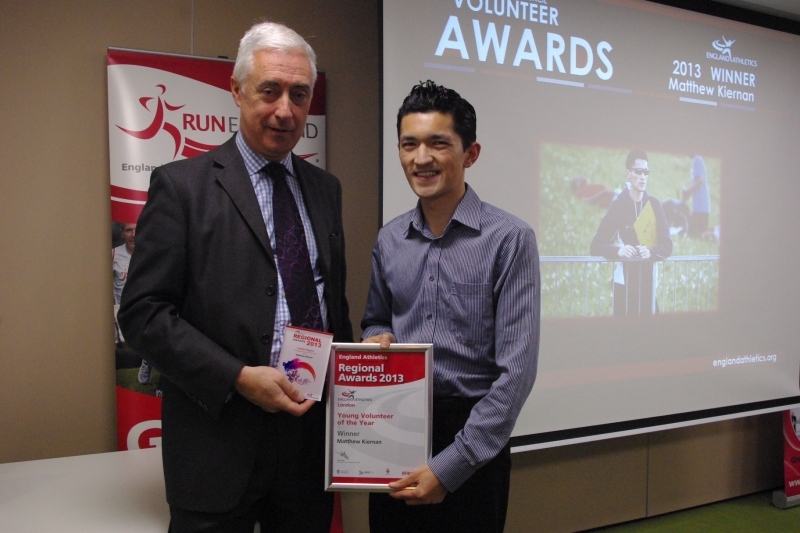 Athletics - and Croydon Harriers - is Matt's passion and his efforts were recognised in 2013 when he won The England Athletics "Young Volunteer" award. We spoke with Matt about his work at the club, what mistakes athletes make, how athletics could be made better, and what he does instead of playing Candy Crush on the train. rb: First off, Matt, you're recently married. So a big congratulations from the runbundle team. Be honest with us, did you check any team results while on honeymoon? Any sneaky emails to the XC team? OK, maybe one or two. rb: We'll keep your secret. So we know you're kept busy with the club, but how exactly would you describe your role at Croydon Harriers? mk: I do a bit of everything really. 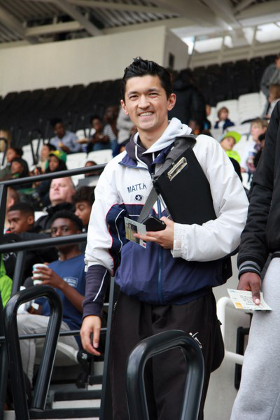 I coach 2-3 times a week at Croydon Arena with middle-distance to endurance athletes, mostly teenagers. It's very rewarding. It ranges from getting people involved in the sport for the very first time, right up to helping athletes qualify for Championship Finals or beating their PBs. Away from that, I also team manage, which is shorthand for organising the teams for competitions, of which there are many. For the very big competitions I’m often booking hotels or coaches. It's a far-reaching role. Oh and I also do our media: our Website, Twitter etc. I’d like to confirm at this point that my wife does in fact see me and is very supportive. rb: Wow! You've been doing this a while though, so hopefully it wasn't a complete shock to your wife after the marriage. When exactly did you first become involved with athletics? mk: I’ve always loved athletics. I remember waking up extra early on a Sunday morning to watch the London Marathon coverage on the BBC. It wasn’t until the last year of primary school that I actually did a race of any description. It was an 800m race on a 200m track. And I got lapped. The eventual winner of the race thought I was actually winning so made an extra special effort to whizz past me. I joined Croydon Harriers shortly after and the rest is history. rb: Sounds like you're kept busy. How much time would you say you spend each week on the various jobs? mk: You know when you see people playing Candy Crush on the train? Well my version is club admin. I’ll respond to emails, sort the teams out, send out the group messages and do anything else that needs doing. Commuting is boring, so I find it's a great use of time. I can only hope that people have their phones on silent when I’m messaging them at 7.30am. Coaching is 2-3 times a week, probably about 4-6 hours in all. Tuesdays and Thursdays are the main training nights. Often there's a race at the weekend and there's a Sunday training every other week. Basically the majority of spare time is athletics-based. And I have to say, I absolutely love it. Again, just to reiterate, my wife is very supportive. rb: Assuming you have any left, what do you do in your spare time? mk: I see my wife! rb: Running seems to be becoming more and more popular, especially as a hobby, but a lot of people still seem put off joining clubs. What do you think the biggest misconception about athletics clubs is? mk: I think there's always a worry looking in from the outside at clubs that they are elitist or are going to be "too good" for anyone new. I'm sure I speak for 99% of the clubs in the UK that can assure anyone who has doubts that this isn't the case. 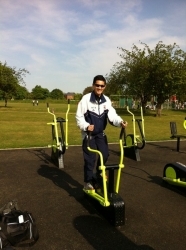 I think that all clubs should be encouraging all abilities to join in and give it a go. rb: Any good advice for anybody who's planning on joining or has just joined a club? mk: The important thing I try to stress with new athletes is to go at your own pace and spend the first few sessions just getting used to your surroundings and pacing. Most new members aren't used to running with a group, and are likely not used to running as quickly. I see a lot of new members go off too quickly in a session and unable to continue after one or two reps. It's only natural of course, but if they just held back a bit it could mean for a very productive session that will benefit them greatly in the long run (pun intended). rb: And how about more-experienced athletes? Are there any mistakes that you see them making? mk: To put it simply: overdoing it. It's an easy trap to fall into. Your times might be coming down, you're running as fast as you ever have, but then you don't rest as you train so hard to try and improve even more. Rest days are so important, as is having your training on a 3-4 cycle wherein one week is easy, one medium and one hard; or variants of this. I've met some athletes in the past that didn't take a rest day for months and ran themselves into the ground. So in short, have a rest. rb: What about prolonged breaks? We hear tales of some of the elites taking one or two months off at the end of their season. Would you go that far? mk: I can certainly understand that. At that level the demands on the body are so much greater. Plus it's also their job so it's essential they do everything they can to be ready for the following season. I think Lorna Kiplagat slept for 15 hours a day when she was at her peak. Normally I recommend a week to a fortnight before building up again. rb: As great as athletics is, things can always be improved. What do you think the biggest improvements could be to athletics at the club level? mk: Where to start‽ I think that the local leagues and competitions are still well-supported so I would't change too much there. On a National level in terms of track and field leagues, I'm a bit worried about their future. There have been a few high profile clubs who have withdrawn in recent times and just this year not a single club applied to replace them. So I think that needs a revamp. Maybe a regionalised version with a National playoff might add extra gravitas and interest? rb: Cross-country suffers from this problem as well. Any similar ideas for that? mk: In cross-country, I'd love to see some kind of National Championship Grand Final with local league winners being invited to compete in at the end of the season. I'm amazed that doesn't exist already in all honesty. rb: Great ideas all round. These are all improvements that could be made to an already-fantastic sport. But is there anything that particularly worries you about athletics? mk: Obviously the number of officials and volunteers at events is always a worry. Without these hardworking troopers the sport wouldn't exist. They are absolute heroes. It was great that the Games Makers were acknowledged at the Olympics, but the majority of volunteering time is needed at a grassroots level to help keep the sport going. So I think greater exposure to get people involved as volunteers is much needed. rb: But organisations like parkrun and GoodGym show that people are willing to get out there and volunteer. Do you think anything could be done to make volunteering at track & field and XC meetings more appealing? mk: That's a great point about parkrun and GoodGym. parkrun have the volunteer t-shirts and points you can win if you come forward to help. GoodGym have the virtual badges for the good deeds you do on the runs and t-shirts as well. So I think that track & field athletics could learn from these initiatives. Even just applauding the volunteers before or after an event would be a bonus, which in fairness is getting more popular. The advantage of course with parkrun and GoodGym is that the time needed to volunteer is much less than the entire day that's usually needed for an athletics meeting. So from that perspective I'd argue it's much more appealing for people to volunteer for. But then you're into the realm of talking about changing athletics timetables and that's a dilemma no one has the answer to. rb: I think we just need more Matts. Regarding coaching, there's been a shift - in the UK at least - to a multi-event approach for youngsters entering athletics. What are your thoughts on this? mk: I'm 100% behind this for anyone who is under 11 or anyone of any age that doesn't have an idea about what event they'd like to do. It builds up your core skills, teaches you the basics of every event and gives you a clear indication where your talents may lie. They may also be the next Jessica Ennis-Hill. rb: And how about older athletes? mk: I move away from the multi-event approach when an athlete is older than 12 and says "all I want to do is such-and-such an event." If that's all they want to do and that's where their passion lies then I think we as clubs should facilitate that. People may not agree with this of course and that's fine. But what I would say is that I'd rather not be forcing people into doing things they don't want to do, so I'm more than happy to let people choose their event if they know what that is. Having said all that, I always recommend the multi-event approach initially. rb: So what if a 10-year-old turns up and wants to be the next Mo Farah and only run run run? Any clever ways of getting them to jump and throw and work on fundamentals? mk: I think I'd set out the usual multi-events sessions but always state that there'll be laps of the track to break up each activity. Promising them laps should usually give them the incentive to finish the mutli-event activities. I'd probably keep the running portion of the activity for the end of the session. There's also going to be elements of running in the jumping and throwing sections like in the run-ups. That's the beauty of multi-events. rb: For anybody in or around Croydon reading this, how can they get in touch with you? mk: New members are always welcome ages 6 upwards and no upper age limit. For more info visit www.croydonharriers.com. For under-14s specifically visit www.croydonathletics.com . rb: And you have a blog, don't you? mk: Yes, I write a blog about my time in the grassroots athletics scene Do have a look. rb: We love a good blog. Expect it to appear on our links page. Our final question then, and we ask this to everybody. If you could race against, and beat, any athlete from any era in any race. Who, when, where, what would it be? mk: Drugs have no place in our sport, it's heart breaking when clean athletes on an international level lose out as a result. Therefore I think I’d put myself in the proclaimed "Dirtiest Race of All Time" in the 100m at the Montreal Olympics. Only fourth-placed Calvin Smith never failed a drugs test in his career out of the top five in that race. Madness. Smith would later be given the bronze after Ben Johnson’s DQ. rb: Your wish is granted. Matt, it has been a pleasure speaking with you and we wish you all the best with Croydon Harriers and your future exploits. We think they and athletics are very lucky to have you.